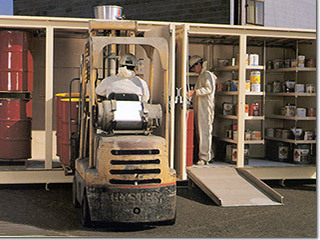 SafeSite chemical storage buildings are strong enough to withstand explosions, interior pool fires, and extreme temperature swings. Therefore, customers can safely store hazardous chemicals such as used oil and hydraulic fluids, chlorine, gasoline, or diesel fuel. Customers can safely store pesticides, fertilizer, paint products, batteries, or propane. Furthermore, you can enhance community awareness and reduce collection and operations costs with a Permanent Household Hazardous Waste program. 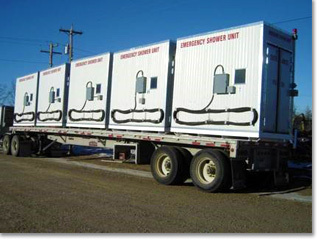 The emergency shower unit is designed for drenching or flushing of eyes and body in emergency situations. Therefore, it combines an emergency shower, eyewash, and drench hose in one unit. Shower units are required at any job site where the eyes or body of any person may be exposed to harmful corrosive materials. SafeSite buildings meet FMRC Class 6049 (NFPA 30) standards. Customers are assured of safe secondary containment for ground water protection with SafeSite chemical storage buildings. SafeSite buildings are available in either a two-hour or four-hour fire rating with the strength to withstand explosions, interior pool fires and extreme temperature changes. 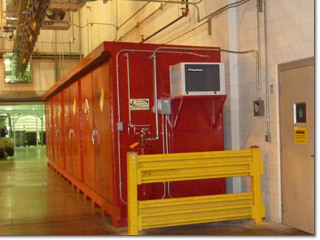 SafeSite buildings comply with federal, state and local regulations including IFC, IBC, EPA, NFPA and OSHA.